Rat Register Number: 821, Initiated 19 November 2000, Proposer David Berglas, Seconder Roy Hudd. Born in Birmingham, Kenny's first professional show business engagement was in 1950 when he joined Burton Lester's Midgets. Later, he became a D.J. with the Mecca Organisation and a clown and ringmaster with Billy Smart's Circus. Pantos and ice shows followed, before he formed the musical double act The Mini Tones with Jackie Purvis. They worked extensively, and with great success, then George Lucas engaged Kenny to play the robot R2D2 in the original STAR WARS film. Consequently, Kenny played the role in the 5 sequels and was even engaged as a consultant on the 2015 version, STAR WARS; The FORCE AWAKENS. Other film roles include Time Bandits, The Elephant Man, Willow, Flash Gordon, Amadeus, Mona Lisa and Labyrinth, bringing him international fame. In 1978, his footprints were immortalized in concrete at Grauman's Chinese Theatre in Hollywood. Television work includes Dave Allen at Large, Casualty and The Chronicles of Narnia. 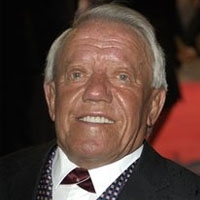 His biography; From Tiny Acorns-The Kenny Baker Story was released in 2009. His marriage in 1970 to actress Eileen Barker (deceased 1993) produced two sons; Christopher and Kevin. Although only 3' 8" in height, Kenny Baker was something of a giant in the entertainment business.